Dry rattle given on ground or at takeoff; drier and harder than that of Lapland Longspur. 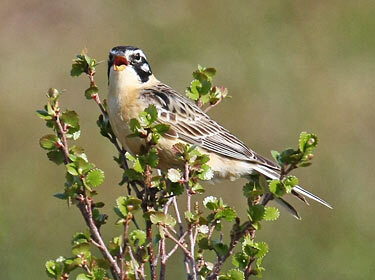 Does not have flight song as does Lapland Longspur. 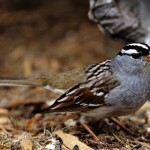 Description: Brownish-black tail with white outer tail feathers; thinner bill than other longspurs. Breeding adult male has black-and-white patterned head; rich buff nape and underparts; and white shoulder patch that is often obscured. Back and wings are brown and sparrow-like. Breeding adult female and all winter plumages are duller overall and lack black markings on head; breast and sides have thin reddish-brown streaking. Habitat: Migrants are found in open grassy plains and pastures. Prefers areas covered with thick, short grass. 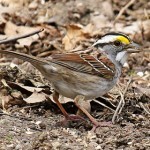 Where in Nebraska: Rare to occasional spring and fall migrant and winter visitor in east-central Nebraska. Largest number of sightings from Adams and Webster Counties. 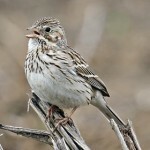 Field Notes: Longspurs get their name from the elongated claw on their hind toes; resembles that of larks. Fun Facts: Smith’s Longspur males are not territorial and females, for one week in June, are known to mate with several males on average 350 times, resulting in the hightest copulation rate in birds.